Heat up oil from sardines in a pan and fry garlic till fragrant. Add in taucheo and chilli and fry for 2 minutes. Next, add in water, oyster sauce and season to taste with salt and sugar. 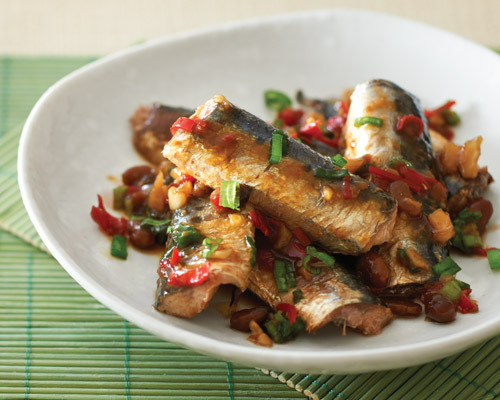 Stir in sardines and let it braise gently until sauce thickens slightly. Lastly toss in spring onions and serve hot with rice. Comments: This lip-smacking dish is low in calorie and high in Omega 3 fatty acids which plays an important role in lowering bad cholesterol. Vitamin B12, also found in high concentrations in the fish, helps to protect the walls of the arteries which promote cardiovascular health. The high protein content provides amino acids that are essential for tissue repair and maintenance as well as a healthy immune system. Further lower the salt content by not adding the salt in the recipe. Enjoy this dish with a bowl of brown rice to enjoy the health benefits!